Blogger 101 will tell you that Flatlays are a key component of blogging. Curating images on a flat surface with a pretty background is one of the most successful ways of promoting your blog and brands you are featuring and working with. Being able to take a pretty picture and write a good post is also very very important in blogging; blogging is all about selling. Selling yourself, selling your niche; selling what you’re reviewing. It’s also all about being yourself, being honest and being thrifty. When I started my blog almost three years ago, I never intended for it to look like this. It was always meant to be a selling page of sorts; I would paint my nails, style my hair etc. in the hope that someone would like what I as an amateur had done and would want to hire me to do it for them. What changed for me was my use of my Iphone; my Social Media presence and how much time I was willing to put into this little hobby of mine. I used to spend hours and hours (I still do, but I take bulk photos now due to my job having me out of the house all hours of the day) taking blog photos, taking photos for instagram and getting pretty images to illustrate my blog content. This was the difference between a selling page and what you see here now on LoveRosiee. I was spotted by a fairly small brand, asked to represent them with my images and page and the rest, as they say, is history! Flatlays, in the two and a half years I’ve been blogging, have gone out and come back into fashion. But, are you a lover or a hater of them? 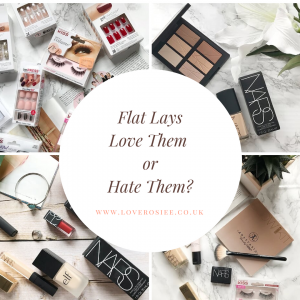 What is Flat Lay you may ask? 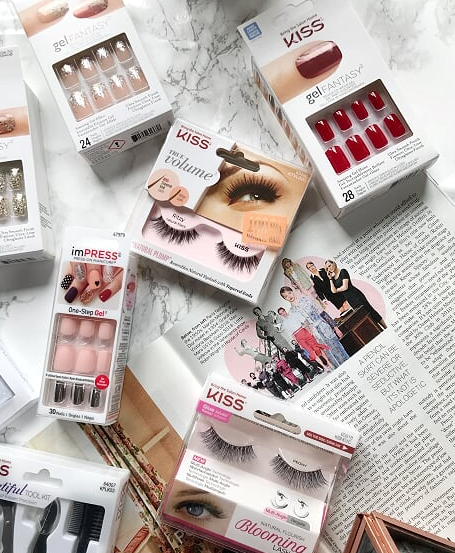 Flat Lays are an easy way to show off lots of different products in one snap! They are simple and easy to do with minimal fuss. You don’t need to spend money on buying fancy backgrounds, props are quite easy to come by if you know where to look! Flatlays back when I started blogging were all about clean lines, symmetry and balance. Now, in 2018, Flat’s are more about looking as if you have many gorgeous items strewn across your blogging area/desk at home. 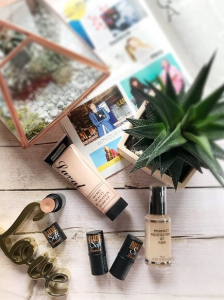 Flat lays can be seen as flashy and show-offy but I LOVE them! 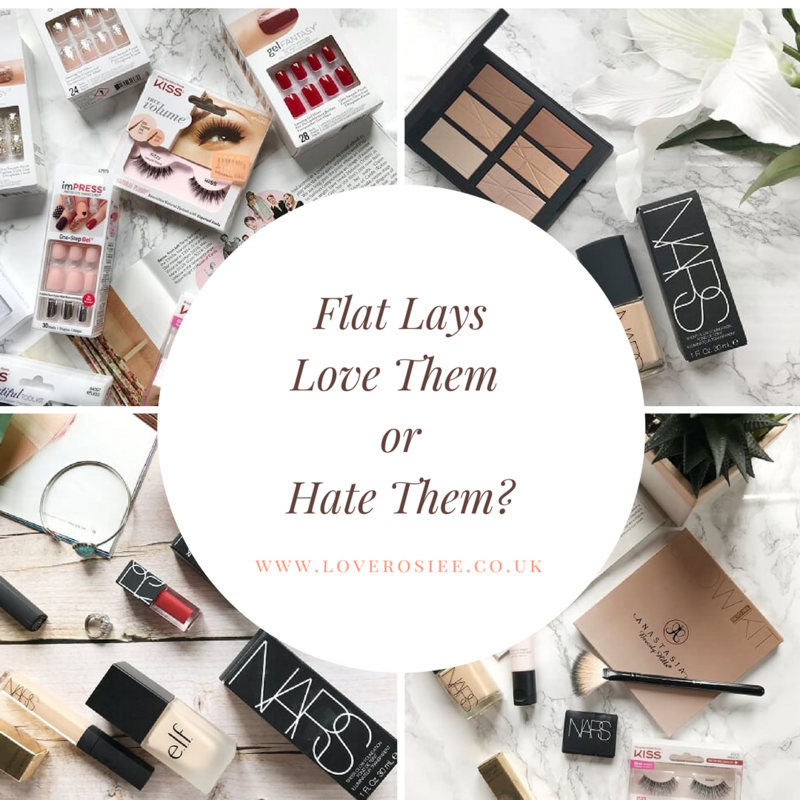 They have seriously come back into fashion and wherever you look on Instagram, there are beautifully curated Flat Lays of all shapes and sizes. The start of any good flat is the background. 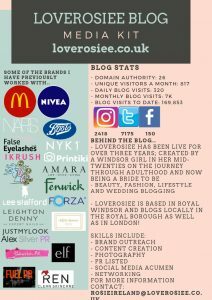 I tend to go for neutral backgrounds and some bloggers would warn you away from white backgrounds. I still use plain white backgrounds sometimes if the products I’m snapping contrast nicely! This distressed wood backdrop is from Photo Backdrops, a very popular option for loads of bloggers right now! You can also pop into your local homeware store, B&Q, Dunelm, Homebase, to name but a few; and grab a few samples of wallpaper to use! 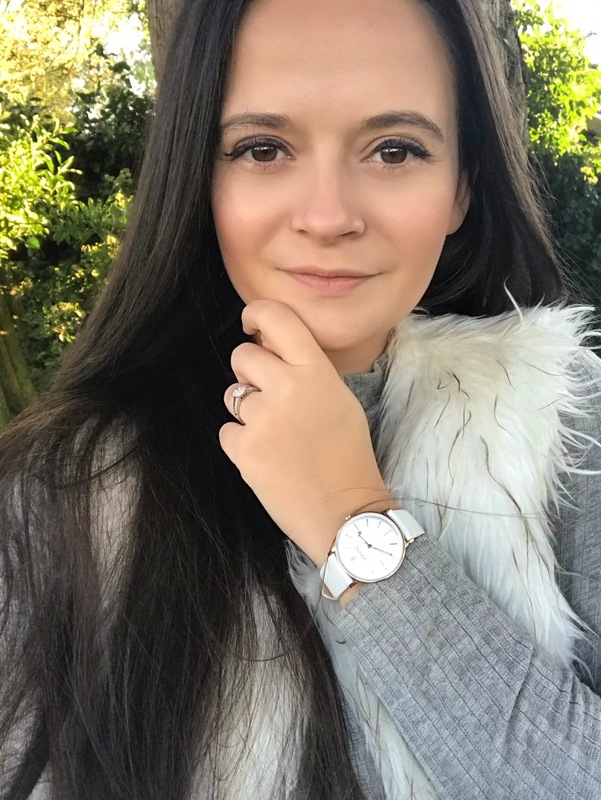 I tend to stick to earthy, woody backdrops but lots of bloggers mix it up with marble, pinks and glitter! you can’t go wrong, really! 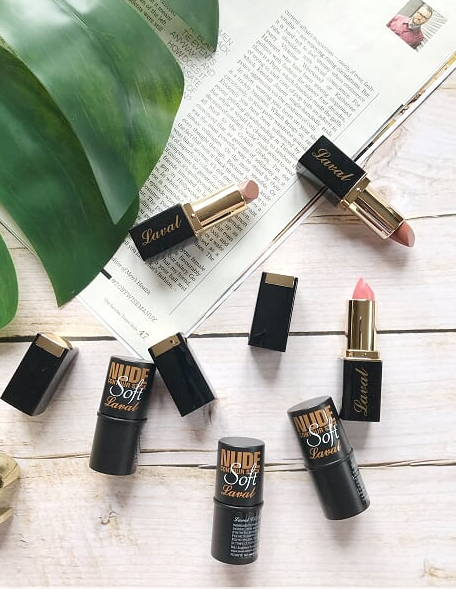 Laying out all of your items in a curated way, as in labels up, lipsticks up and ready (not a pun I promise!) qill ensure your Flats look the best! I do lots of beauty Flat Lays and I find it so fun to lay out all of my new beauty buys and make them all look pretty together! 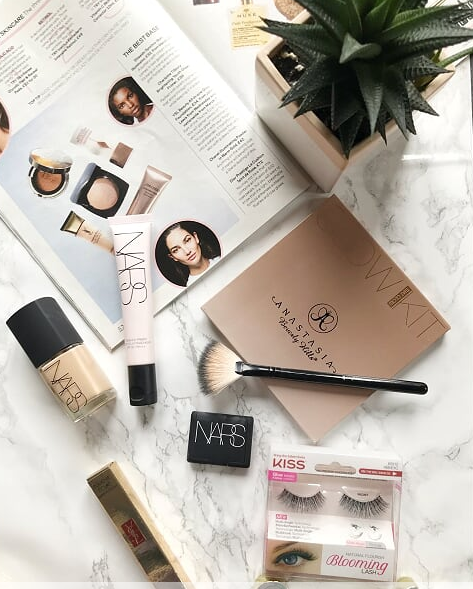 Chloe from Lady Writes spoke recently about adding a magazine page to your Flat Lays to give it an extra component and depth. This tip has been invaluable to me and I’ve started implementing it in loads of my latest snaps! 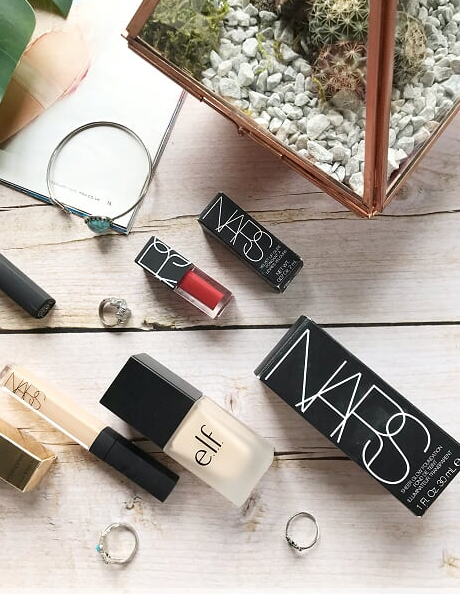 I really do understand why some people don’t like Flat Lays. Some people don’t agree that everything on Instagram and your blog should be curated or staged. I get that it can promote a fakeness in the blogging world and that it can be intimidating and damaging to see only this “show reel” of images. I also see why people think they could end up breaking the bank – hopefully I’ll have helped dispel that one by now! I read recently on my Twitter feed that some felt like Flat Lays are almost random and pointless items are added that don’t make sense. I’ve seen my fair share of rose gold everything in a photo just because it’s on trend! Hell, I’ve been guilty of it too when navigating how I want my Social feeds and blog to look like! I personally am a LOVER of Flat Lays. If you find me on Instagram, my feed is full of them! Whether you love them or hate them, I feel like you’ll be seeing lots of them for the foreseeable! Previous Post Be An IKRUSH Babe! I LOVE flatlays! I always have. I love how some of them can be so simple, and some of them can be crazy and full. Makes me so excited to see what one i am going to see next! I love flat lays, I’ve worked so hard on mine lately and trying to improve them and I’m loving it so far! I’m definitely a lover of flat lays, I’ve been obsessed with them ever since I started blogging! I love a good flatlay but I am a massive lover of my fairy light images that I do! They are still beaut though, I love yours! I do love a good flatlay but I’m trying to mix my feed up a little! I love looking at others’ flatlays, but I’m so awful at creating them myself. A tips post would be really useful.